Sundays are always our last chance to be lazy. Football, napping, napping while the game is on, going for a drive, vegging around the house–all prime Sunday post-morning activities. So who in their right mind would want to slave over a hot stove on such a deliriously delightful time of ease and respite? I wanted something delicious and homemade for dinner, but I didn’t want to have to work too hard at it. I went on a scavenger hunt in my pantry, consulted my self-made cookbooks, and wound up only one item short of glory. Hubs offered to go to the store to acquire said item, and we were in business, proverbially speaking. All of the recipes before you can be made and ready within an hour, and most of the items are what one normally might keep around the house. And what you want is something quick, healthy, and yummy that didn’t take much work. 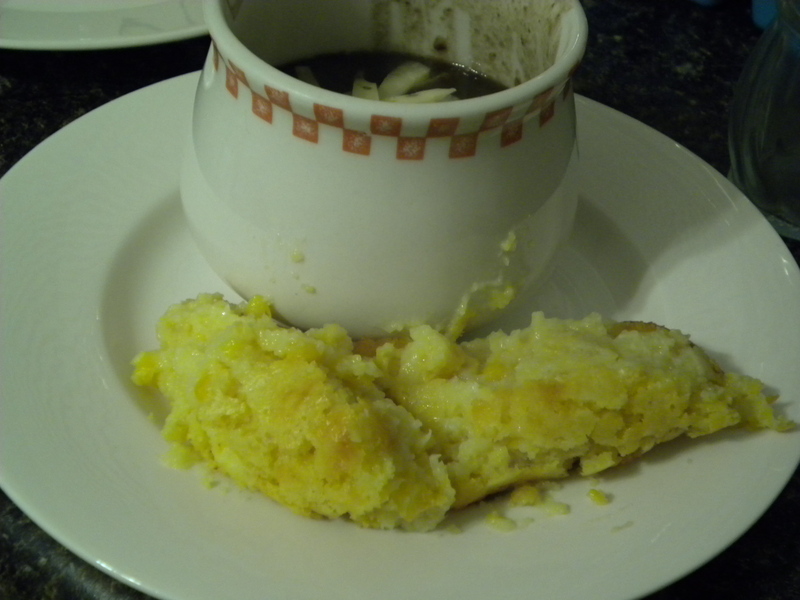 And what could be better than a spicy bean soup and cornbread on a cool autumn night? 1–All good things start with onions, olive oil, and garlic, so do it up right and saute 1 red onion, diced and 5 cloves of garlic in a little bit of olive oil. I suggest sauteing the onion first, then adding your garlic midway through so your garlic doesn’t burn. 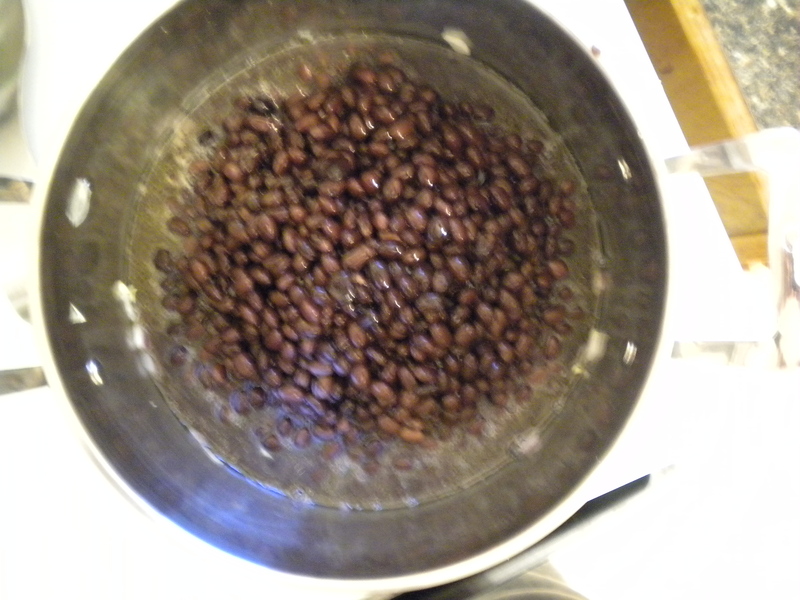 2–Add to this 5 cans of black beans, undrained. Believe me. Just go ahead and dump the little ones in. 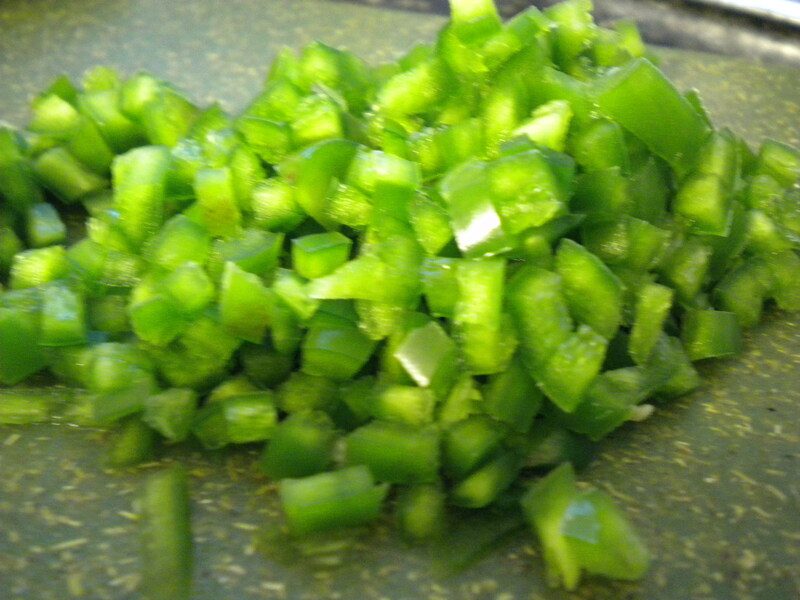 3–Add 5 T. minced jalapeno peppers, 2 1/2 tsp. 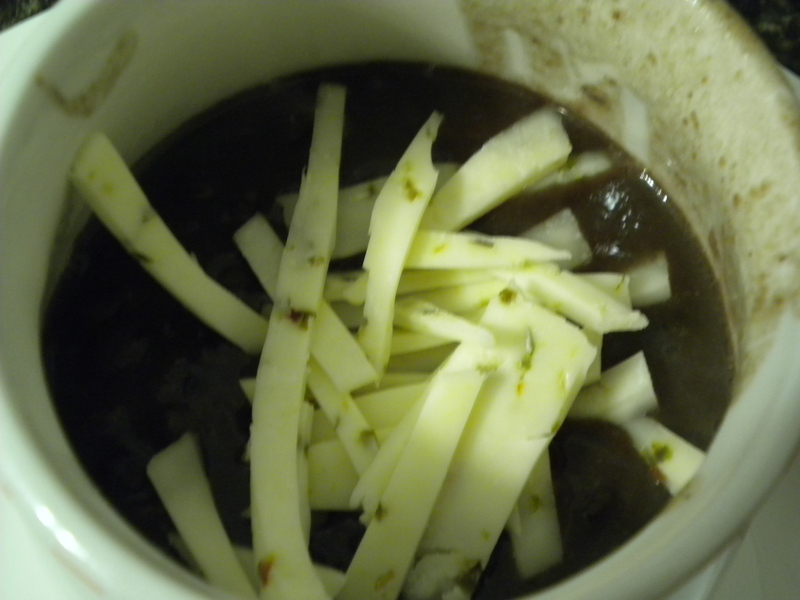 chili powder, and 2 1/2 tsp. cider vinegar to the mix. Stir it up nice and good now. 4–Get your soup to simmer, covered, for at least 30 minutes. Taste and check the seasoning, add a smidge of salt and pepper if you think it needs it, cumin might also be a good one to throw into the mix. NOTE: Thirty minutes is the minium amount of time required to acquire such grand and spiced yum yum time. I, however, let the stockpot sit on the stove for about an hour. NOTE NOTE: If you prefer, shall we say, a brothier soup, add a can of chicken stock or a can of veggie stock to the mix halfway through your allotted cooking time. 5– If you have bowls you can warm up in the oven, get’em on in there and get’em out when it’s time to dish up. Dress it up with whatever you like on your beans: I used strips of Pepper Jack cheese and sour cream, other ideas are cheddar cheese, monterey jack, tortilla strips, crushed Doritos, crushed Fritos, green onions, etc. Remember, this is made from your PANTRY RAID! 1–Get out a large mixing bowl, open up a box of Jiffy bread mix and beat in 2 eggs and 1 stick of melted butter to the mix. 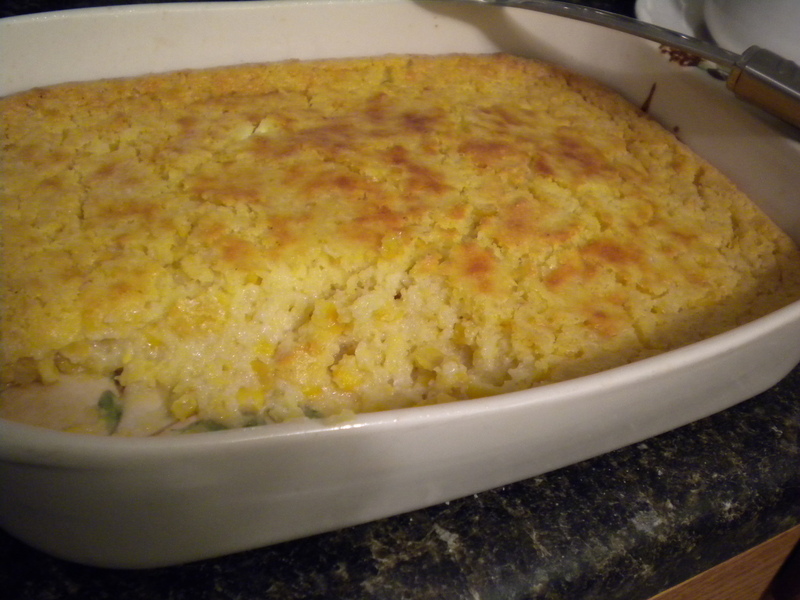 2–Mix in 1 small can of corn and 2 regular cans of creamed corn, along with 1/4 cup milk and 1/2 of an 8 oz. carton of sour cream. 3–Bake this for 1 hour at 350. “Please resist the urge to sneak a peek and pop the oven door open, because it will delay your baking….” says the voice of experience…..(ahem). The consistency, when poking in a toothpick, should be clearly baked and custardy, not runny or liquidy. If the latter is your case, then crank up the heat to 375 and bake for an additional 10 minutes. Not like I’m trying to be vegetarian, but this is a great meatless meal and my husband didn’t complain about the lack of meat in this dish. 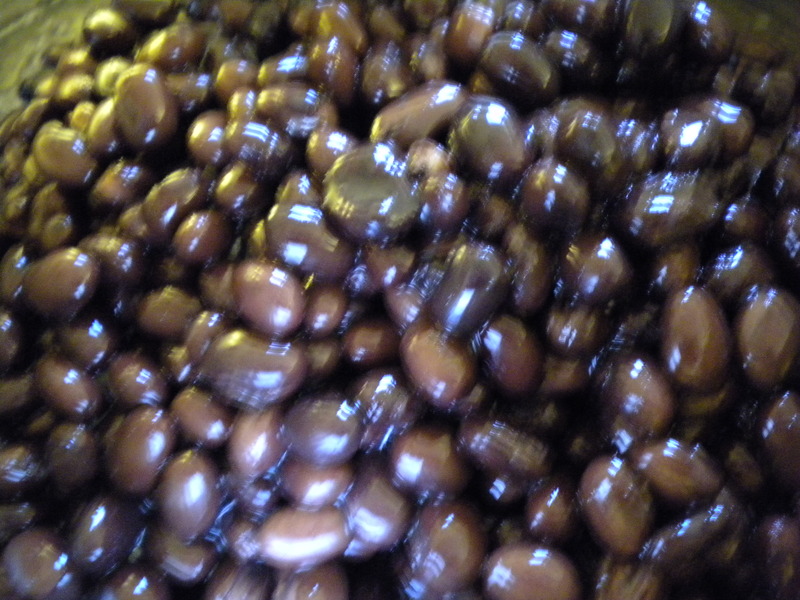 He loved it, and even I, who am not usually a fan of beans–it’s a texture thing– loved this meal. It was cozy, warm, fairly quick, totally easy, and mostly delicious. Now you have my permission to go on a pantry raid and make this meal! Let me know how it goes for you. Sounds yummy! Thanks for the veggie-friendly post! it makes quite a bit of soup; you ought to invite a few friends over for a meal. HOWEVER, this is the kind of thing that will definitely freeze well for later. Hi there! I’ve recently found a joy of cooking after watching (wait for it) Pantry Raid! Have you seen it? The title of this entry grabbed me because of that, so way to go LOL. I enjoy cooking but have found recipes to be pretty rigid. I always precisely follow the recipe the first time and then take one or two liberties later, but this is really hard because I’m not a confident enough cook. When I watched the first season of Pantry Raid a few weeks ago, I realized how fun and easy it is to be creative. Since then my meals have improved immensely, and I actually look forward to cooking now. Hey! Thanks for checking it out! I actually have not seen that show, but now I’m curious and will have to look it up. Good luck with your own pantry-raiding and let me know what you come up with! 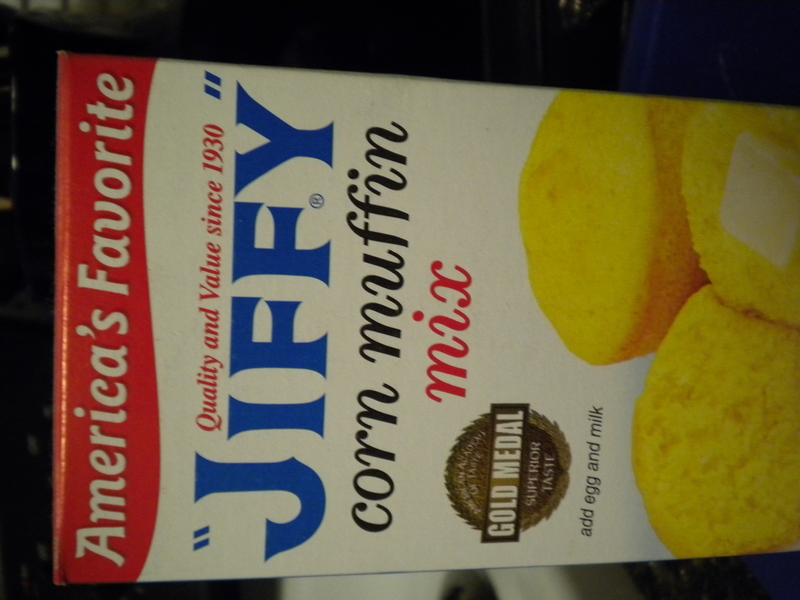 Mmmm, Jiffy Corn Muffin mix. I believe this may have been what manna was made with in the Old Testament.